Photos by Sara Wickham (left) and Jenn Burt. 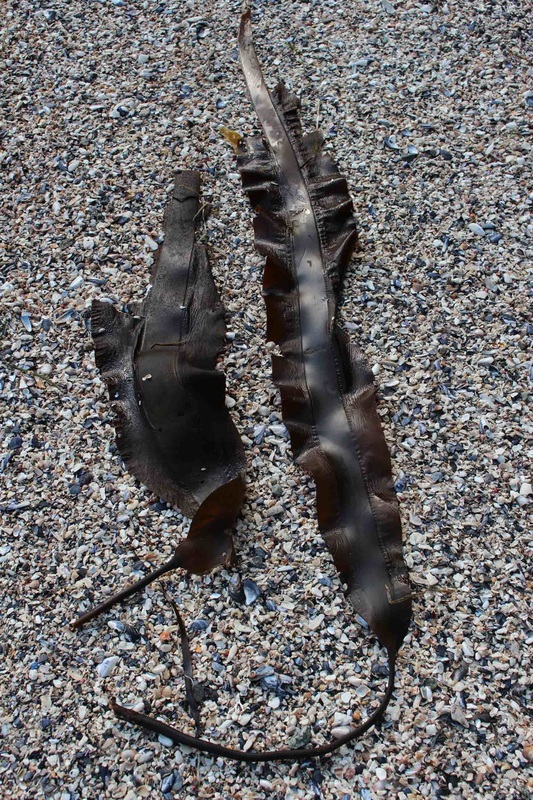 This perennial brown seaweed can be identified by its characteristic thick, 5 cm wide midrib. The dark brown blade, which gets to 1.5 m long and 28 cm wide, is puckered on either side of the broad midrib and has slightly ruffled edges. This blade dies back in the fall, leaving the stipe — which is cylindrical at the base and flattens towards the blade — and the branched holdfast to persist over winter. Broad-ribbed kelp grows on rock in the extreme low intertidal and upper subtidal. It is found in areas of high current or moderate exposure to surf, from the Kodiak Archipelago in northern Alaska to Monterey County in southern California. 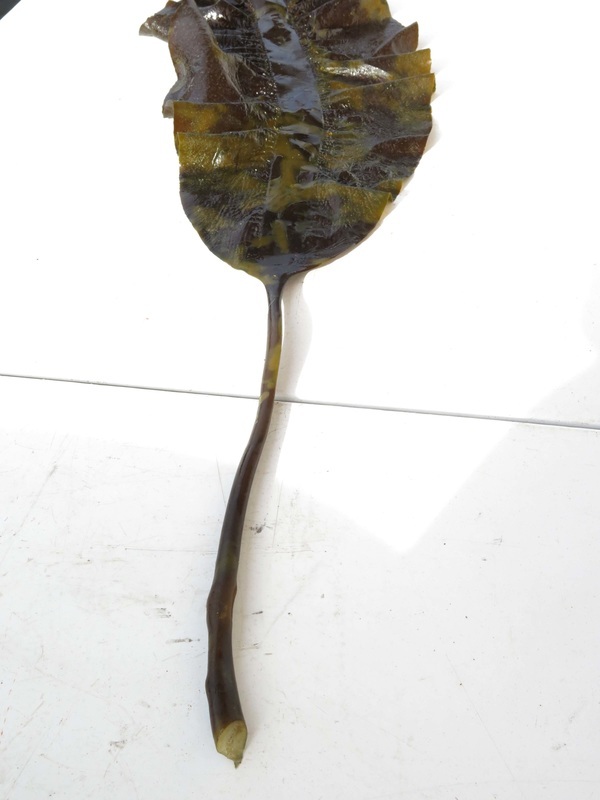 Laminaria species, which may initially appear similar, lack a midrib altogether; however first-year broad-rib kelp plants lack a midrib, which may lead to some confusion. Broad-rib kelp blades begin to die-off in the fall when water temperatures drops to about 14°C. Lindberg, M. and Lindstrom, S. (2010). Pleurophycus gardneri Broad-ribbed kelp. Seaweeds of Alaska. Accessed 17/09/2015. Druehl, L. 2000. Pacific Seaweeds: A guide to common seaweeds of the west coast. Harbour Publishing: Madeira Park, BC, Canada. P. 187. O'Clair, R. and Lindsrom, S. Pleurophycus gardneri Setchell et Saunders. In Klinkenberg, Brian. (Ed.). E-Flora BC: Electronic Atlas of the Plants of British Columbia. Lab for Advanced Spatial Analysis, Department of Geography, University of British Columbia, Vancouver. Accessed 17/09/2015.